The National Puerto Rican Day Parade in New York will be hosting a special ceremony in honor of Julia de Burgos on June 3rd beginning at 5:30 pm on E. 106th Street and Fifth Avenue, where de Burgos died. The ceremony will commence with a Taíno blessing, followed by readings from four Puerto Rican poetesses. 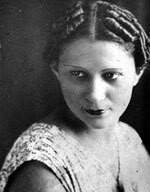 At 6:30, El Museo del Barrio will host a reading of the play, JULIA DE BURGOS: CHILD OF WATER, from renowned Puerto Rican playwright, Carmen Rivera.